Working as part of the Zarraffa’s team since 2008, M10 continues to oversee strategic brand communications and PR. With the 100% Aussie owned company making strides across the country with new store footprints, national PR management of recent openings resulted in some tangible ‘runs on the board’ across multi-markets. 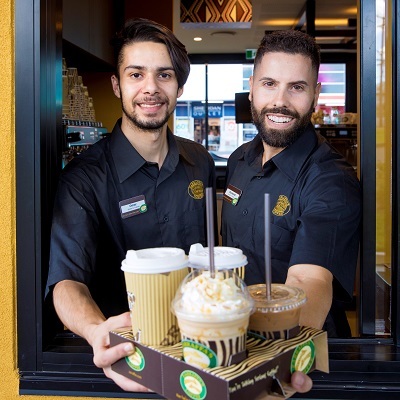 Aussie-owned specialty coffee QSR, Zarraffa’s Coffee, has kicked off its 2019 expansion with twin, bi-coastal openings this month. Zarraffa’s has opened the first purpose-built location in the Perth suburb of Clarkson, while on the other side of the country, has made its initial foray into greater Sydney with an opening in the suburb of Bankstown. CEO Marnie Sheldon, said that while the two locations were diverse in demographic profiles and located 4,000 kilometres apart, Australia’s appetite for quality coffee could not be denied. The 2012 purchase of an existing coffee chain in Western Australia delivered an instant footprint across suburban Perth and Kalgoorlie with the latest opening bringing the number of drive thrus to six. The Clarkson store signifies the first of their traditional drive thru sites that customers in the East are more familiar with and is being run by experienced franchisees – Paul and Jennifer Meyler. “Clarkson represents an opportunity to introduce coffee drinkers to a full Zarraffa’s store experience; with a comfortable instore environment and a full-service drive thru,” said Mr Meyler. The Bankstown, NSW store opening represents the fourth under the NSW Area Developer (AD) arrangement, steered by experienced franchisees and ADs – Ben Old and Dion Scholz. Ben and Dion have been spearheading the drive for new locations and expansion in New South Wales and had a successful foray with the Belmont North (Newcastle) store in 2017. Zarraffa’s has opted to operate the Bankstown store as a corporate location until things are calibrated and up and running for franchisee ownership. For more information about Zarraffa’s Coffee, visit www.zarraffas.com.